In 2011, a United Nations commission came to a powerful conclusion: access to broadband internet is a basic human right, matched by the likes of housing, sustenance and healthcare. Arguments can be made that widespread access has transformed entire economies while kick-starting others, with Finland even going so far as to command its ISPs to provide 1 Mbps connections to all homes regardless of location. Both the United States and the United Kingdom have similarly ambitious plans, and all three of these countries have one particular catalyst in common: funds. The harsh reality, however, is the economies that stand to gain the most from sweeping internet adoption are also the least equipped to enable it. In early 2010, the European Bank estimated that a project to roll out passive optical fiber to 33 cities in the Netherlands would cost nearly €290 million. The mission driving such funding? "To stimulate innovation and keep Europe at the forefront of internet usage." It's the answer to a problem that could undoubtedly be categorized as "first world," but consider this: Internet World Stats found that 92.9 percent of The Netherlands' population routinely used the world wide web in 2012. Let's just say it's easier to invest in an initiative that you're certain nearly 9 in 10 citizens will use. In the whole of Africa, just 15.6 percent of residents are connected to the internet, which is under half of the world average. It's also home to vast, inhospitable landscapes that are economically inviable to crisscross with fiber. All of that being said, nearly a sixth of the globe's population resides on the continent, representing a monumental opportunity for something -- anything -- to connect the next billion people. As it turns out, there are actions presently ongoing to make a significant mark in the course of history. Google, Microsoft, Carlson Wireless, Tertiary Education and Research Network of South Africa (TENET) and a host of other powerful entities are collaborating to bring high-speed internet to an underserved continent via TV white spaces -- a low-cost, highly adaptable technology that's poised to explode. For now, Cape Town, South Africa, is acting as a proving ground for what will eventually be a far larger experiment. The core goal is actually quite simple: to beam hope to a disconnected society, with unused bands between TV channels acting as the medium. For the myriad companies involved, simply educating consumers on how TV white spaces (TVWS) work is a challenge. I'd argue that the terminology (and in turn, branding) could use a bit of work, but the gist is perfectly comprehensible. As it stands, television broadcasts travel over predefined frequencies, which can essentially be envisioned as bowling lanes positioned side by side. In practice, broadcasters only use every other lane to transmit, with the lanes betwixt left open as a buffer. From a broadcasting point of view, the worst-case scenario involves the bleeding of one channel into another -- hence, a buffer channel. To continue the analogy, it's certainly possible to imagine a pitiful bowler hurling a ball into the lane beside him, but it'd be practically impossible for him to accidentally toss it two lanes over. Regardless of whether a nation broadcasts using analog (as in South Africa's case) or digital (as is happening in the United States), the description remains valid. The overarching goal of the White Spaces Coalition -- which was formed in 2007 by the likes of Google, Microsoft, Dell, HP, Intel, Philips, EarthLink and Samsung Electro-Mechanics -- was to make use of the buffer channels for something greater. In other words, they want to turn lanes of broadcasting security blankets into active channels for wireless internet distribution. In the case of the Cape Town trial, Google was responsible for providing the funding and guidance, while Carlson Wireless provided the hardware and TENET executed on the ground. 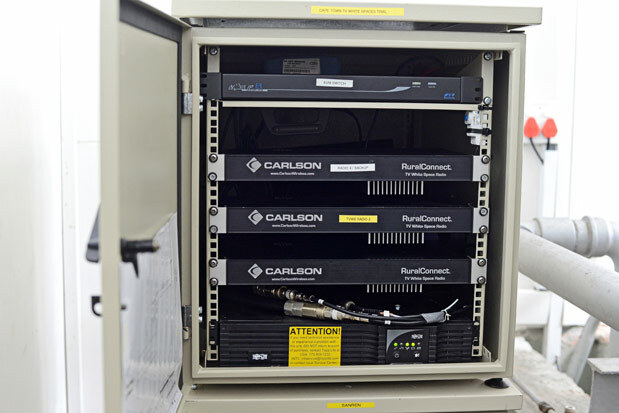 Carlson Wireless equipment powers the internet transmissions to 10 local schools in Cape Town. Arno Hart, a project manager for TENET, explained it as such: each empty channel that's purposefully unused by TV broadcasters has the potential to be used for showering schools, hospitals, playgrounds, libraries and entire communities with wireless internet access. Why wouldn't the world at large be interested in making better use of what's already there? Well beyond my own line of sight sat a trifecta of schools connected to an endless stream of knowledge using a barebones hardware arrangement that is hardly more complex than your average radio setup. As it turns out, the biggest hurdle isn't a philosophical one -- it's a mathematical one. TV broadcasters aren't fond of allowing any other wireless service to encroach on their transmissions. 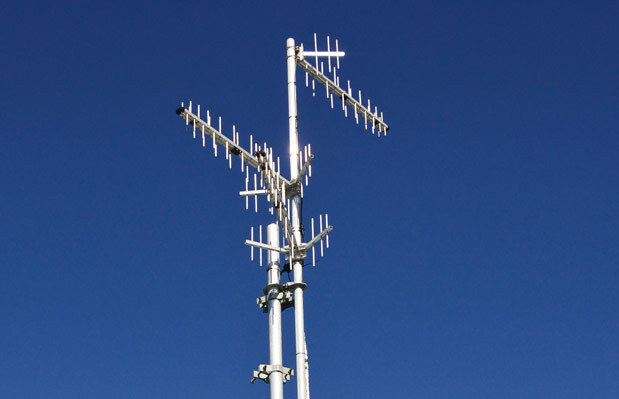 If a rival broadcaster (or, indeed, an internet connection served by a TVWS base station) were to transmit in an immediately adjacent channel using too much power, interference and visual degradation would occur. So, in order for TV white spaces to ever be taken seriously, those in favor of pushing it needed a way to definitively show that it could operate without causing quality nightmares for the TV stations next door. In 2007, the Federal Communications Commission found that early white space hardware simply didn't function consistently enough. Said equipment was engineered to sense when and where TV broadcasts were happening, and then direct its own internet signals around it. In testing, however, it wasn't able to stay in its own lane with a high degree of certainty. A lot has changed in the six years since. 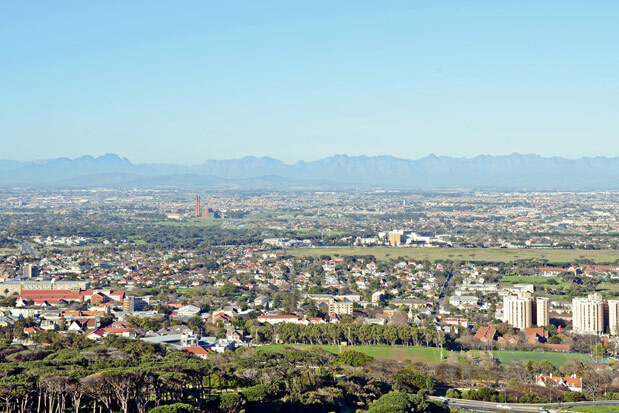 TENET's Hart recently met me at the Stellenbosch University Faculty of Medicine and Health Sciences complex in the northern suburbs of Cape Town. At the time of my visit in mid-July, Hart was overseeing an elaborate trial that fed 10 nearby schools access to the internet via a wireless distribution method that simply did not exist a decade ago. In a pair of nondescript, metal boxes capable of holding less cargo than the suitcases I used to travel here, sat the tools necessary to make all of this wizardry happen. A fiber backhaul cable was jacked in, along with three TV white space transceivers. These rack-mounted boxes were concocted by Carlson Wireless -- a rural communications company that recently saw its hardware used to bring internet to sparsely populated sections of California's Gold Country. From there, a trio of antennas were adorned on the rooftop of the aforementioned facility, with each one responsible for both sending and receiving internet signals from three or four schools. Hart informed me that each participating school had a nearly identical antenna and transceiver box pointed roughly in the direction of where we were standing, with the most distant positioned around five kilometers away. I squinted a bit in an attempt to cut through the haze hovering over the city. Well beyond my own line of sight sat a trifecta of schools connected to an endless stream of knowledge using a barebones hardware arrangement that is hardly more complex than your average radio setup. An arrangement that, according to Hart, "costs around one-tenth the price" of a cellular alternative. In May of this year, decision makers from some 15 African nations joined as one at the TV White Spaces & Dynamic Spectrum Africa Forum in Dakar, Senegal. The goal was to understand how this technology could provide a cost-effective solution to connecting millions upon millions of Africans, dispersed across many thousands of miles. 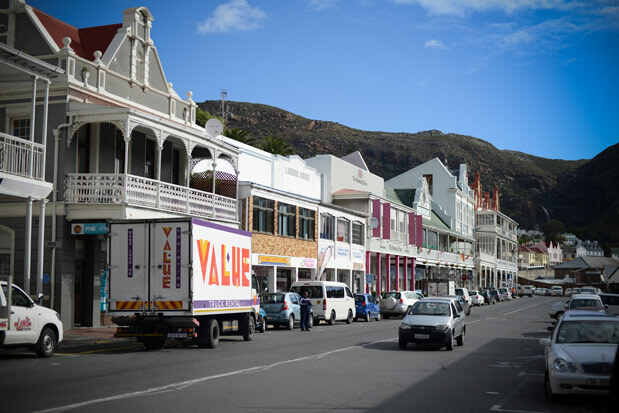 This half-year experiment in the heart of the Western Cape will largely determine the opinions of those who wield the power to implement it elsewhere. In many ways, the trial provides access to the real internet -- the one that can only be truly understood with a broadband connection -- to these students and teachers for the very first time. "If TV white spaces can work here, it can work anywhere," Hart said. 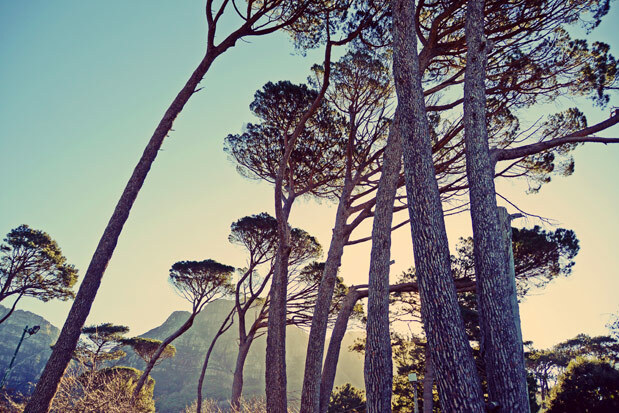 Table Mountain soars high above a dense and sprawling Cape Town cityscape, dividing the rough and tumble working district from the pristine coastline -- an area that seems to be perpetually on holiday. 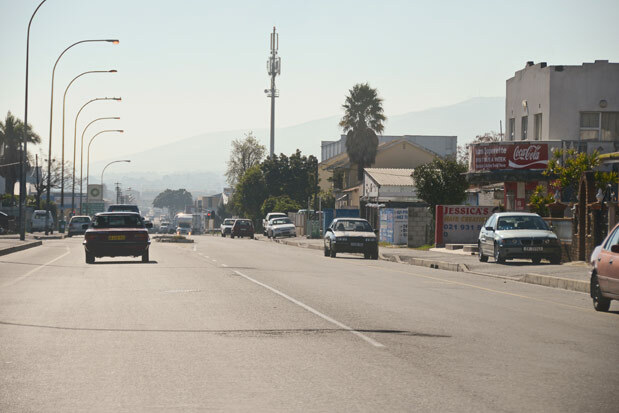 The city is home to the most crowded television spectrum in all of South Africa and due to the mountainous terrain, effectively every available even-numbered channel is spoken for. These channels are used to broadcast analog television networks to many of the city's 3.75 million people, and as such, the Independent Communications Authority of South Africa (ICASA) has to be extremely careful not to green-light a technology that interferes with another. 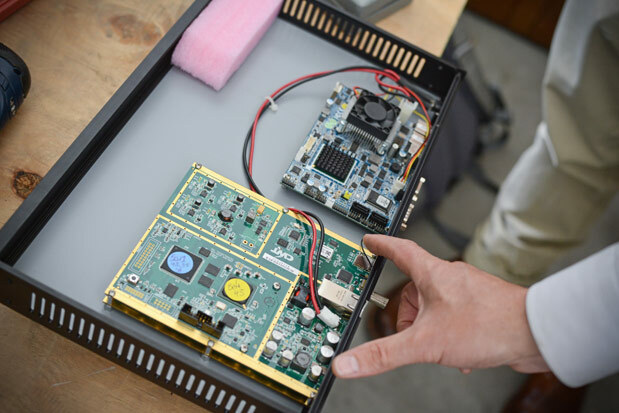 Prototype hardware handling internet transmissions; these two boards are channeling change in education. As Hart described it, the technology used here has effectively no margin for error. Data collection will occur 24/7 for the entirety of the trial, with regulators watching intently for even a hint of cross contamination. If at any point the TVWS signals cause interference or degradation in neighboring TV bands, it's going to be mighty tough for proponents like TENET and Google to overcome. When asked the obvious question, Hart turned his head from left to right: "There's been absolutely no interference thus far." The reality of what's possible when connecting entire villages, cities, countries and continents to a stable, high-speed internet connection is nothing short of breathtaking. 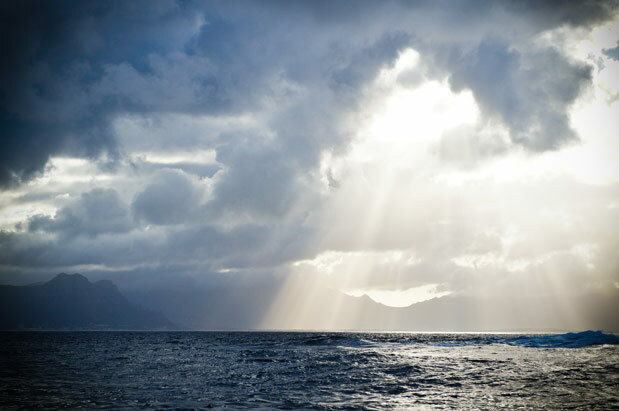 Last year, I traveled to Samoa, an independent island nation in the middle of the Pacific Ocean, and discovered a society that was experiencing broadband for the first time -- not via wire, but via unseen waves of HSPA+. It transformed a hotel owner's ability to showcase her property on the web, to respond more quickly to booking inquiries and to gather more intel about the nature of her incoming guests' preferences. It's one example of a life altered merely by having access to the web at large, but it doesn't take a visionary to understand the global impact of such a change happening to everyone in a given area. 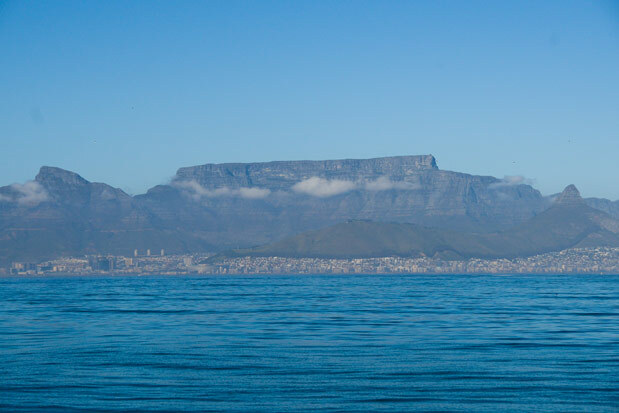 While situated on a dock at the V&A Waterfront in the city's downtown area, it's shockingly easy to peer around and mistake Cape Town for a city without woe. There's an atypical amount of nature surrounding the obligatory concrete; avant-garde brands like Aston Martin and Burberry dot the coastline; and practically every face employed by the service industry dons a smile. Outside of the pampered tourist spots, however, struggles are evident. Dilapidated housing lines entire streets, while steel fences and padlocks are common lawn ornaments. Despite having the largest economy in Africa, there are extreme deltas between the haves and the have-nots in South Africa. According to the latest United Nations Development Program (UNDP) report, around a quarter of the population is unemployed and living on well under $2 per day. But, as I learned during discussions with Hart and Anton Kruger, owner of local network vendor ABIT, even those who can afford internet are often given a product that would be wholly unacceptable by American standards. In particular, Hart pays "around $110 per month for 2 Mbps ADSL service," and the packet loss is so severe that he "cannot remotely connect to his work machine through a VPN service." Naturally, this personal frustration is an opportunity for a company like Google, which can grow by removing barriers for users who've yet to experience its ecosystem. The reality of what's possible when connecting entire villages, cities, countries and continents to a stable, high-speed internet connection is nothing short of breathtaking. To that end, I had an opportunity to speak with Alan Norman, Google's spectrum lead, who explained that the 10 chosen schools were selected in order to prove that TVWS was a viable and affordable last-mile solution. For those unaware, that's geek speak for getting internet access from a terminal box to potentially hundreds or thousands of nearby homes, apartments, etc. 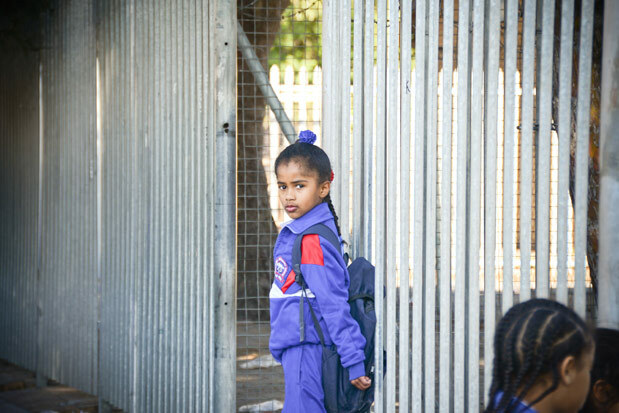 Hart continued by explaining that each of the chosen schools had access to the internet using ADSL connections, which are quite common in South Africa. The idea here was to intentionally pit TVWS against the only real alternative that exists -- an alternative that's wildly expensive and bizarrely unreliable. According to Norman, "access is critical to Google's business -- the whole business depends on people having access to the internet." That's a fairly unabashed explanation of things, but it also sheds real light on why Google is so interested in facilitating such a trial. (Hint: it's money... and altruism, but certainly money.) Specifically, he informed me that Google's two primary goals here were as follows: "Proving a user benefit -- that it can provide last-mile access to a school with sustainable broadband speeds -- and to show that Google doesn't interfere with the operation of televisions." Most of these schools -- which have between 800 and 1,300 students apiece -- relied on a 2 Mbps ADSL connection. In my estimation, that's woefully inadequate for even a single-person small business in the United States, and I've certainly heard my share of loud sighs as my wife and I competed for throughput on the 10 Mbps connection we have at home. One school in particular had a pair of 8 Mbps connections, but the actual speeds (as opposed to advertised) were so sluggish that it had to divide its email and internet access. Teachers couldn't afford for their email to grind to a halt whilst a class of pupils engaged with an interactive frog dissection on the web. Due to the TVWS equipment being directly connected to TENET's historically reliable fiber ring, the educators I spoke with exhibited visible signs of relief and gratefulness when asked about the experience. "There's just no comparison," said Shawn Schlosz, deputy principal at Cravenby Secondary School. "Before, I would have to download a YouTube video at home, load it onto a flash drive, bring it to class the following day and display it on a projector. Now, I have student pairs load the page on a shared netbook and follow along on a more personal level. "The trial routinely delivers upwards of 4 Mbps in both directions -- upstream and downstream -- and even with pre-production equipment, most schools have only dealt with one or two momentary outages thus far. As one instructor put it, "I would've never known it went down, but the fallover to ADSL caused me to notice an immediate speed change." Darren Murph (left) converses with TENET's Arno Hart (right) about the implications of TV White Spaces in South Africa. 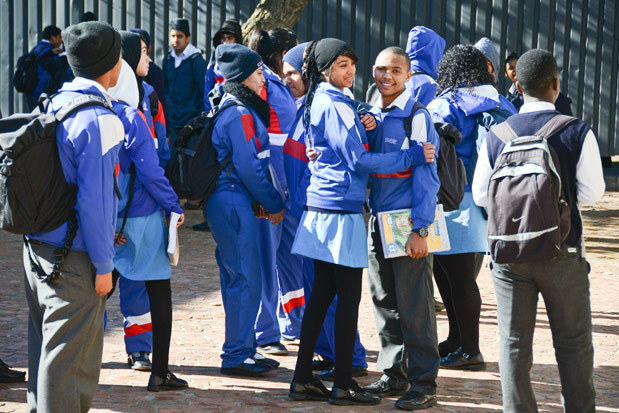 Gerdus Nieuwoudt, an IT teacher at The Settlers High School, described how the newfound speeds and reliability enabled him to create a cloud-based ecosystem for teachers to universally sign in to upload student scores, progress reports and syllabi. As it stands, computer databases are rare in these schools, and they're all offline and altogether disconnected by nature. Combining this data and hosting it online will dramatically hasten the record-transfer process should a student need to change schools, and one can imagine the benefits if like-minded instructors across Cape Town are able to collaborate online when it comes to overhauling syllabi and course requirements. In fact, one teacher was recently able to engage in a video-driven Skype call for the first time ever at school. Hearing her describe the experience -- replete with jubilation and exuberance in her voice -- was akin to hearing Evel Knievel speak of his first long-distance motorcycle landing. "I could see their faces," she exclaimed, "and the interaction was just so much more pleasant." In many ways, the trial provides access to the real internet -- the one that can only be truly understood with a broadband connection -- to these students and teachers for the very first time. Every single administrator I spoke with confirmed that they are committed to working with TENET and local authorities to continue receiving internet via TVWS once the trial concludes in October. Hart suggested that the services will be offered at a price that matches or bests those offered by ADSL providers, making the switch for those involved a practical no-brainer. 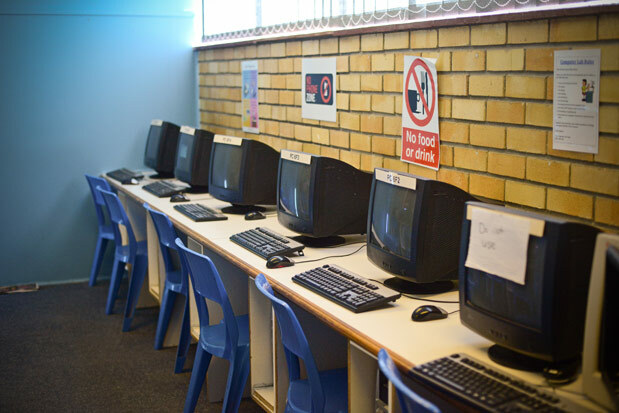 A typical computer lab in South African schools. While the official trial has yet to finish, it's obvious that those impacted most directly have already drawn their own conclusions. And, so long as TV broadcasters continue to be unaffected by its use, TV white spaces stand a great chance at becoming a legitimate last-mile option for ISPs. In many cases, the economic unfeasibility of running conventional last-mile cabling to lower-income areas creates a wretched cycle -- these citizens could benefit greatly from low-cost computing devices as well as stable access to the internet, but their inability to pay up front prevents that from ever happening. Beyond the potential issue of airwave contamination, the other obstacle that TVWS faces is a common one: business justification. Implementation costs are 10 times lower than conventional cellular towers, but service providers would still need to forecast a large enough paying population in order to validate the initial outlay. In many cases, communities don't possess the computers necessary to connect to the internet, further hurting their chances of TVWS reaching them. But, as smartphones creep into historically low-income regions, the groundwork for an interested customer base could be established. I'm not suggesting that for-profit ISPs will utilize TVWS technology to philanthropically blanket underserved areas, but if governments and nonprofit institutions are able to deploy internet access to more places on a more cost-effective basis, many of those presently unable to further their own education and research their personal ambitions could at least stand a chance to do so. Initially, those who stand to benefit are local ISPs (who will now have another distribution method to sell) and internet-craving citizens with the means to purchase monthly access for their homes. But it's the second wave of beneficiaries that matter most. Due to the low cost of implementation, schools, libraries, restaurants, laundromats and untold other public facilities will soon have a viable and affordable option for getting connected. Patrons of those facilities will be exposed to broadband, as the children in these 10 schools are. While no plans currently exist to blanket entire regions that are home to historically underserved and impoverished communities, there now exists a technology that would enable such a reality at a far more sensible cost than mass cellular rollouts. In merely three months, one trial school in particular has already had to erect a wall that disallows the use of torrents during school hours. A cynic may suggest that this is proof-positive that giving more access to students will simply lead to more misconduct and require more oversight to see that it's used properly. I disagree. The thought that unfettered access to a high-speed connection could spark that level of curiosity in a child's mind is astounding. Sure, they may dabble in nefarious corners of the web as they learn the ins and outs, but what other universally accessible tool exists today that is capable of causing such mental stimulation? A great deal of future innovation could stem from the process of connecting malleable minds on a grand scale. A great deal of future innovation could stem from the process of connecting malleable minds on a grand scale. Earlier this year, Google's Executive Chairman Eric Schmidt stated the following during an interview in New York: "In [the developing] world, just going from no bandwidth to any bandwidth is huge. The truth about technology is that it's relatively neutral with an empowerment bias. So, it's easy to come out with a positive view. But, there are things you have to manage -- terrorism, et cetera. When [Alexander Graham] Bell invented the phone, he didn't make clear that criminals could use the phone to engage in crime." But, really, who would say the world today would be better off without the telephone?